As a Domo Consulting Partner, we’ve seen an increase in executives reaching out to us to get their hands on this fast growing BI technology. Through working with them, I’ve come to realize that there are key differences that set Domo apart from other dashboard and data visualization platforms. Here are the top 5 reasons that executives love Domo, and why they are driving adoption within their companies. I’ll start off with what is the most appealing aspect of Domo, and what has led to its momentum. Simply put: Domo drives action. Action = results. And executives love results! Simply put: @Domotalk drives action. Action = results. And executives love results! Click & Tweet! Dashboards: Domo’s dashboards get the job done, but are very similar to other data visualization tools out there. Processing tools: Their internal data processing tools are robust, but nothing too different from what is available in the market (although they do package them all in one platform). Data Connectors: Sure, they have a lot of connectors (and I do mean a lot) which is definitely a competitive advantage — but so do a lot of other platforms, and they can be buggy at times. One could even argue the pros and cons of being exclusively in the cloud (clearly it worked for Salesforce), but none of those things are what sets Domo apart, and brings the executives running. Domo’s main competitive advantage is their entire methodology is geared towards taking action and getting results. It’s not just a “nice to have.” It’s an “all or nothing.” Let me illustrate by comparing their process for creating dashboards with other business intelligence (BI) visualization tools. Few, if any, drill-downs Most often includes analytics, such as ratio calculations, forecasting, trends, etc. Dashboards are only the beginning. 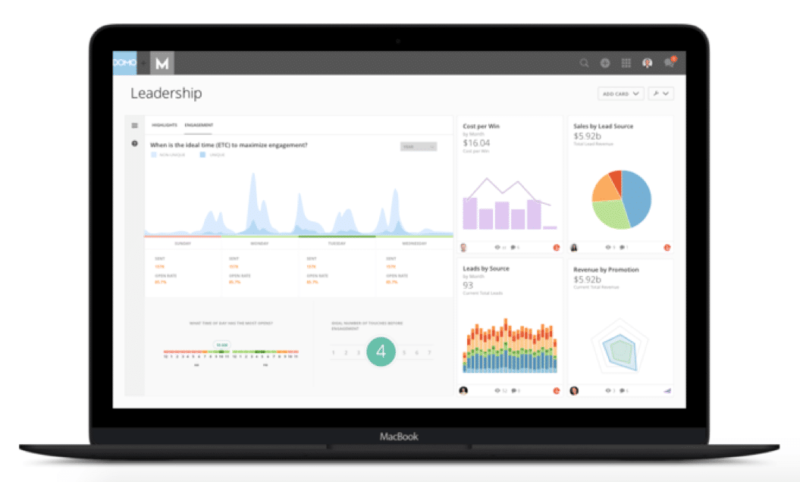 Who wants to stare at a dashboard all day and try to determine how their business is doing? In this regard, Domo’s claim to fame is its alerting capabilities. Actionable dashboards should alert someone when something is out of place. If the executive team has done their strategy right, they should know exactly what they are expecting within a margin of error. If the outcome falls outside that margin of error, then it’s time for action! Here’s an example of Domo’s alerts in their new alert center. 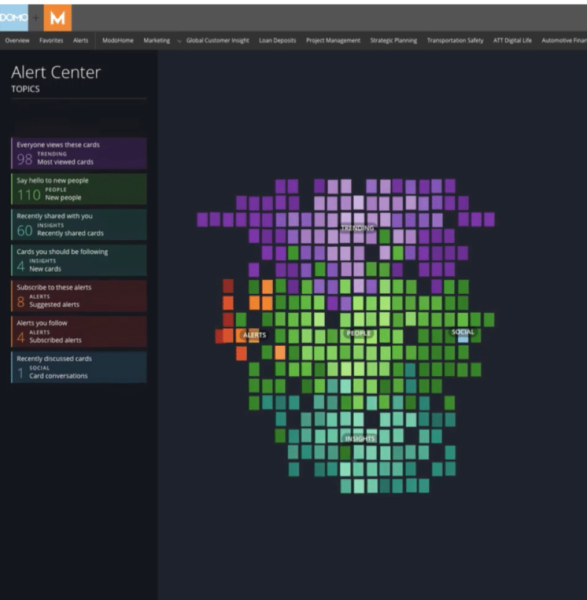 An executive is able to see all of the alerts in real-time as they are coming in across the team, and each type is easily identifiable because they are color coded. 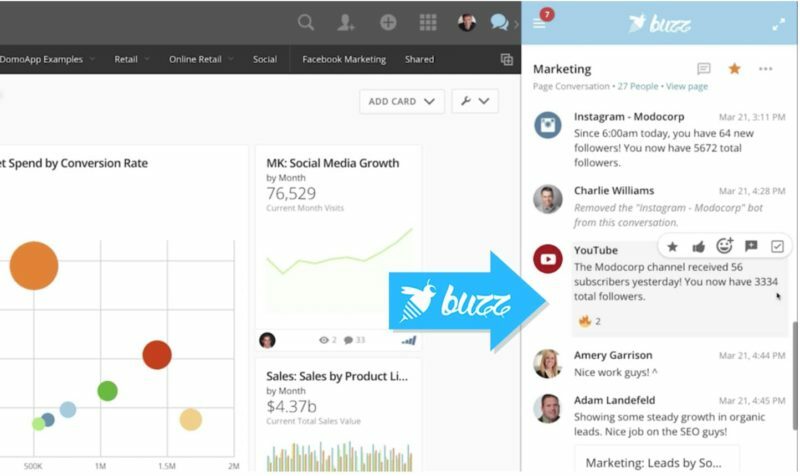 This allows you to quickly follow different conversations or see when sales are down — all from the Alert Center. No alerts for today? Time for a round of golf! 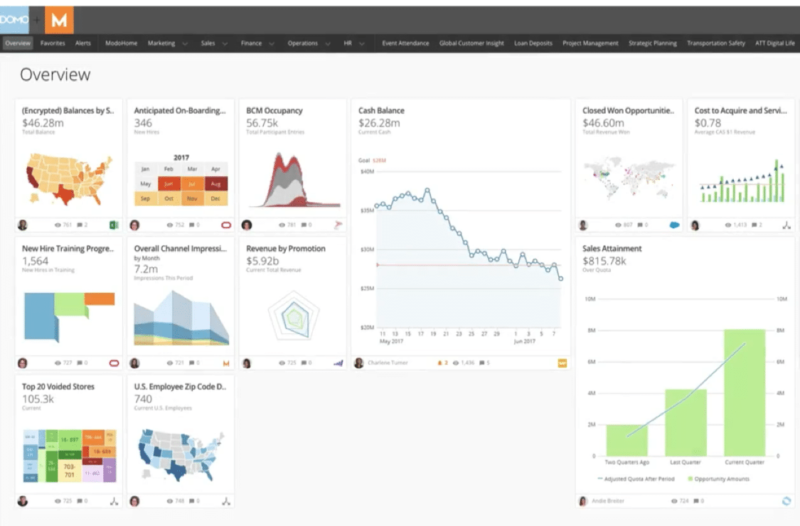 Domo is an all-inclusive platform, or as Domo would put it, a “Business Cloud,” designed with the executive in mind — it’s not just another self service BI tool. The last thing an executive wants is to ask a dozen different people for basic answers to questions that are critical to run their business. Platforms provide an environment where synergies can be realized and ROI gained. And with hundreds, if not thousands, of different tools available in the BI space, it’s no wonder executives are migrating to all-inclusive analytical systems to gain a competitive advantage. Platforms provide an environment where synergies can be realized and ROI gained. Click & Tweet! Domo integrates sales, operations, finance, marketing, IT, and everything else that uses data to solve problems or answer questions, and it does so by simplifying your data management. 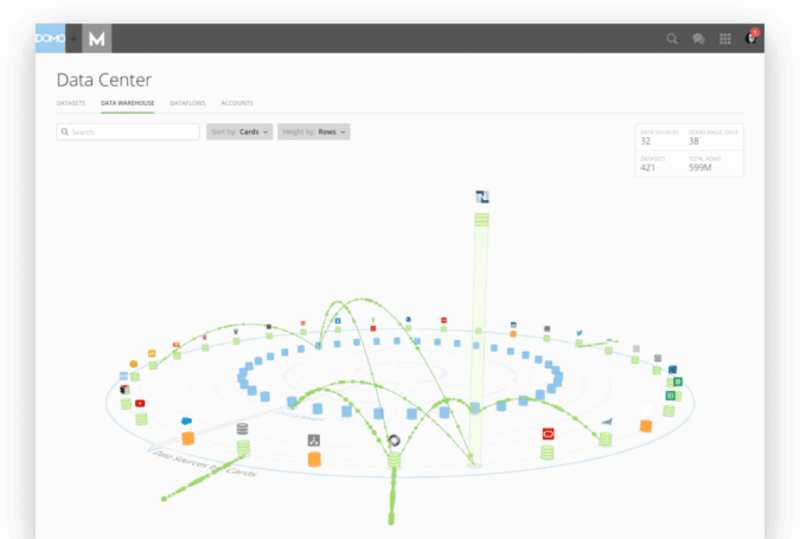 Domo provides simple connections to external data sources, processes your data in-house, and visualizes your data in a streamlined manner that is immediately actionable. For example, here are some of the products, which you would normally have to purchase separately or build on your own, that Domo provides as part of their platform. Internal data warehouse: All your data available in one location, without having to manually connect to 50 different sources. This also facilitates self-service analytics by key stakeholders. Over 450 API connectors: Get up and running with valuable metrics quickly with pre-built connections to your data. Data visualization tool (Analyzer): Create actionable dashboards that display key performance metrics in real-time. Team collaboration tool (Buzz): Communicate via chat instantly and directly with your team and record those conversations for a history of your progress. Extensive resources (Domo University, Dojo Community, Resource Library, Live Support, Dev Portal): It’s clear that Domo was built by business users and business consultants with the executive in mind. 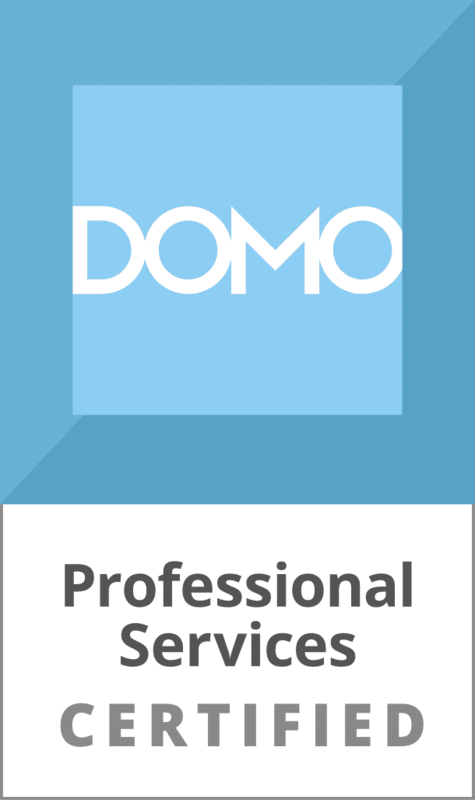 Some of the industry best practices are within the Domo resources. 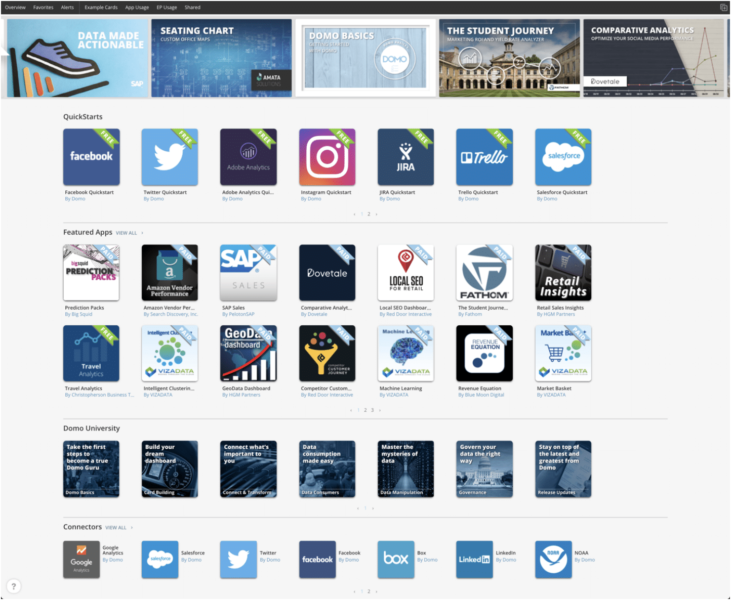 Over 1,000 pre-built applications (think Apple marketplace 10 years ago): Need your development team to create some custom interactive charts, or do some advanced analytics? It might already exist in the Domo AppStore, saving you valuable time and money. And the entire Domo community continues to grow the AppStore more every day. App Design Studio and App Dev Studio: If it doesn’t exist in the AppStore, then your team can usually build it using the resources and documentation available here. Domo’s support team can also help with difficult tasks. Multiple ETL (Extract, Transform, and Load) tools (SQL Magic tools, Workbench, Data Fusion, etc): This is one area that is rare to find in a data visualization tool, but is critical to providing clean usable data. Domo allows you to schedule data transformations that keep your most valuable data up to date and accurate. ALERTS: This is likely the most valuable piece of Domo, and something other platforms have lagged behind on. As an executive, you need to know when things are going wrong. Domo is designed from the ground up to provide actionable alerts when the numbers fall out of line with your benchmarks. Mobile collaboration capabilities: Reports and insights are not actionable if it’s sitting on your desk in the form of a pdf. Domo let’s you see your data, collaborate with your team, and make updates, all while you’re on the go. Data security and governance: Your company and reputation is only as good as it’s weakest link. If you fail to implement a data governance plan, and secure your data, you leave the company open to chaos. Domo allows you to set passwords and create groups that secure sensitive data. 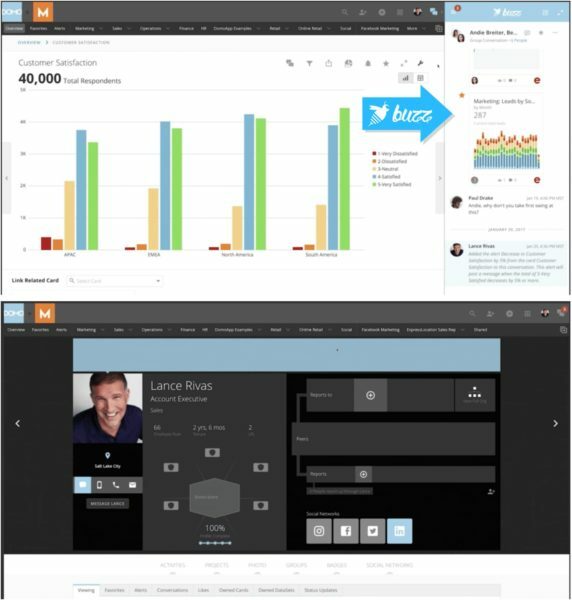 It provides your team with User Level analytics without jeopardizing sensitive information. As you can see, Domo has approached the BI space with an all-inclusive strategy. They have capitalized on the fact that although there are tools for everything, if those tools require steep learning curves, don’t work well together, or only do 80% of what you need them to do, then you end up with fragmented teams, silos of data, and frustration. Unfortunately, this is the same department that is supposed to bring simplicity, clarity, and insights to your most important questions. Think of how many companies out there house your personal data (i.e. financial institutions, healthcare, hospitality, retail, e-commerce, education, etc). Most, if not all, of these companies will reach out to you and everyone else in order to grow their business. That means that your data is in motion at these businesses and executives are ultimately responsible for what happens to that data. PII is one of the fastest growing concerns among executives, especially when GDPR goes into effect in 2018. Mishaps in this area can lead to catastrophic consequences for businesses, including heavy fines from regulators. Domo has approached this issue by providing the ability to encrypt and decrypt data at the individual row level based on permission levels and set Personalized Data Permissions (PDPs) throughout the organization. Domo also has a “publication groups” that allow executives to select specific people who will be able to view certain reports. This is especially useful when you start looking at regional segmentation and sales territories. Executives want answers, and they want them now. Waiting for answers until the next meeting, or for someone to respond via email, doesn’t cut it. Buzz, Domo’s free Slack equivalent, helps team members respond to executive requests immediately. The conversation stays within the dashboard so there is a history of action and progress. With Domo you can find out immediately why campaign ROI is down, and chat directly with those responsible. Or, discuss a dashboard alerting operations managers to the fact that inventory is low. No more last minute trips to the office for conference meetings and gone are the days of 60 deep email threads! Finally, executives love the fact that Domo is infinitely scalable in the cloud. Let’s face it, organizations are either growing or dying, and data structures are racing to keep up. Platforms that are great for a 100 or even a 1,000 person company are not all that great for 10,000+ employee companies and vice-versa. Collaboration and company culture is simply different from company to company. Many tools for a small company (ie. basic data processing tools, spreadsheets, etc) don’t translate into larger organizations where enterprise class tools are required. Domo took a page out of Salesforce’s playbook and, although clunky in the beginning, has embraced the full force scalability of the cloud. This approach helps across the board from data storage to their tools and dashboards. The cloud has experienced challenges over the years with slow load times and lack of basic functions, but one thing it does not suffer from is scalability. Domo is great, but be aware this doesn’t mean it is without flaws. From a pure analytics perspective, Domo has a lot of growing up to do. Many of the tools, although well integrated, can be difficult to work with and a lot of customization is necessary to access valuable data beyond the out-of-the-box data connectors. You must weigh the alternatives available for your team and decide what is best. To stick with a traditional BI tool that is complex and doesn’t provide clear insights for decision making, or move to a platform where immense power is included out of the box, alerts and insights are a given — but a greater company wide commitment is required for optimal benefit. You may find it comforting to know that the most critical step of a successful BI implementation is not the actual BI tools themselves, but the strategy involved. Strategy requires business discovery, data architecture, transformation, and visual design. If you need support with your BI/analytics program to ensure success…Blast can help you assess what is the best BI solution for your company, and create a strategy that drives analytics maturity within your organization. Greg Armstrong is a Senior Business Analyst at Blast Analytics & Marketing. He is involved in helping clients understand their business objectives and key performance indicators through data analysis and visualization tools. Prior to joining Blast Greg was an associate at a venture capital firm in Salt Lake City, UT, where he helped analyze investments and facilitate deal flow. Greg Armstrong has written 2 posts on the Web Analytics Blog.